Iron is the most abundant element on earth by mass. For over twenty-five centuries it’s been used to plow fields, build bridges, cook food, and wage war. Without iron, the Industrial Revolution would have gone nowhere, we would have no trains, automobiles, or machine tools today, and mankind would still be an agrarian society. It is quite simply the most important metal in history. There’s a newcomer to this metal family, though, one that’s making manufacturers take notice. As automakers strive for increasingly fuel efficient and environmentally friendly vehicles, they’re turning away from traditional iron favorites such as gray and ductile iron (GCI and DCI) to compacted graphite iron, or CGI. Also known as vermiculate graphite iron, CGI’s mechanical attributes meet or exceed its counterparts, sometimes drastically so. -The Mill 16 has a fine-pitch and medium pitch cutter body equipped with an innovative single-screw, wedge-style clamping system. This reduces time spent in the tool crib setting the tool and assures rigid, no-fail tool placement. Each pocket on the cutter body is numbered, as are each of the insert’s cutting edges, assuring maximum accuracy and ease of use when indexing to a new cutting edge. 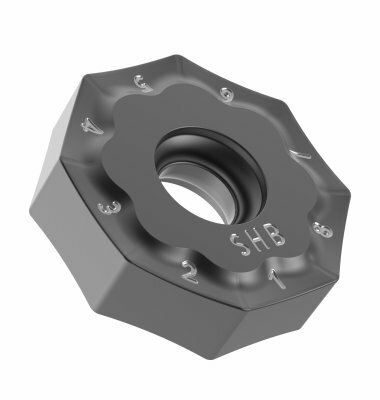 -The heart of the Mill 16 is an octagonal, double-sided insert with 16 effective cutting edges, providing the lowest tooling cost per part possible. The face of each cutting edge contains an aggressive chip-breaker for positive cutting action and increased chip flow. The wedge clamp on either side of the insert’s top face is likewise chamfered to improve chip evacuation. -Mill 16 is available in cutter diameters ranging from 2 in. to 10 in. (50 mm to 250 mm). Kennametal has rated the maximum axial depth of cut (Ap1) at 5.5 mm (0.216 in. ), although depths to 9 mm (0.35 in.) or greater are achievable, an important consideration where casting variation is a concern. 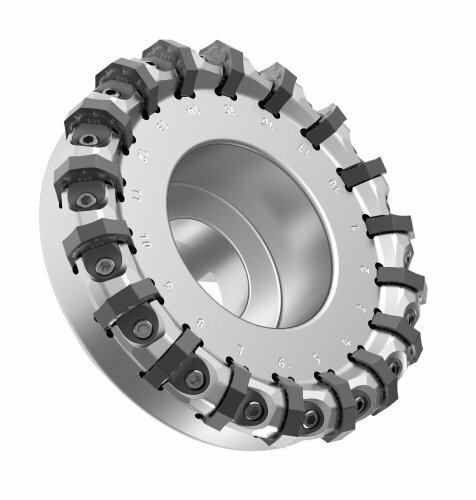 Due to the cutter’s low cutting forces, up to 100% radial cutter engagement is possible. All cutters have internal coolant supply capability. -The carbide is new as well. Kennametal’s grade KCK20 is a PVD AlTiN/AlTiCrN multilayer coating bonded to a wear resistant substrate which provides an average tool life of 30% greater than comparable TiAlN-coated grades. -A wide assortment of insert edge preps, geometries, corner radii, as well as a number of complementary grades assure the Mill 16 is a top performer in a variety of machining conditions, from heavy roughing to semi-finishing and, because of the insert’s integrated wiper facet, fine finishing to Ra 3.2 μm or better. Customer field tests have shown consistent and positive results. During a dry machining operation on a ductile cast iron plate using Mill 16, feed rates were increased by 41% and tool life doubled tool. A gray iron transmission case was machined at a feed rate of 0.39 mm per tooth (0.015 in.) and cutting speed of 208 m/min (682 ft/min), leading to reduced spindle loads compared to the legacy tool and slightly improved tool life. Metal removal rate and tool life on a water pump housing was more than doubled by switching to Mill 16.